Last week in my sketchbook countdown we left off at Megacon of 05. 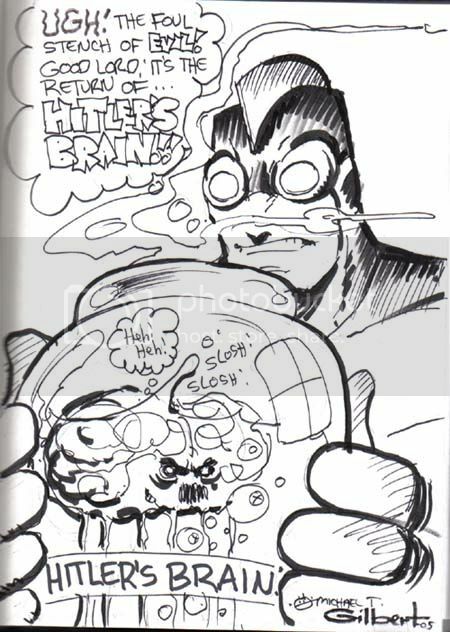 It was my first convention with my Brain Jar Sketch Book. I had already gotten a fantastically cute Patrick the Wolf Boy and I was on the prowl for something that might be a little more horror themed. Although when you think about, werewolves are a staple of horror, I guess I forget about that because Patrick is so cute. Anyway, I found an indy book favorite of mine that I knew would get the horror aspect right. Who was it? You’ll have to check it out after the jump. Michael T Gilbert’s Mr. Monster is sketch number 3! I was very excited about this one. 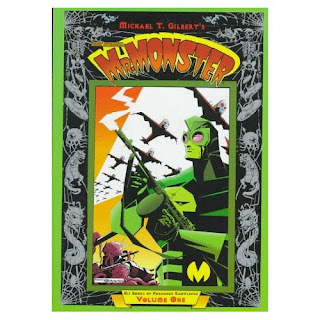 I hope I’m not presuming too much but I’m guessing a lot of people reading this may not be familiar with Mr. Monster. So back in the 40s there was a book called Triumph Comics and they had a psychiatrist character named Doc Stearne. Stearne decides to put on a costume and fight monsters, takes the name Mr. Monster, and is seen in costumer for 1 issue (Super Duper Comics #3). 37 years later Michael T Gilbert blew the dust off the character for an issue of Vanguard Illustrated. He changed the name to Doc Stearn and took a very different approach to the character. The new Mr. Monster dials everything up to 11. Mr. Monster doesn’t just fight monsters; he hates them with every fiber of his being. It is over the top horror, tongue in cheek humor, and action. The position of Mr. Monster also became a legacy that ran through Stearn’s family. On top of that he is joined by Kelly Friday on his adventures…his girl Friday. Told you it wasn’t overly serious. Mr. Monster has made a number of appearances over the years. He has been published by Eclipse, Dark Horse, Atomeka, Image, and probably a few others that I’m missing. The closest thing I could compare it to is the Goon. Track it down, you won’t be disappointed.